Space Marine was the core rules box for a few years. Its focus was on Infantry with allowances made for the odd support Titan. 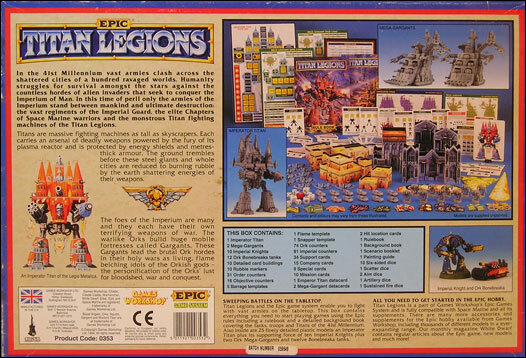 In 1994, Titan Legions was released. It wasn’t a supplement but a full blown rules set and box. It accompanied the Space Marine box and you didn’t need both to play Epic. The box set itself was the fulfilment of a long promise – a plastic Emperor Titan! These Titans were incredibly powerful, being able to level armies within a turns shooting. Also as part of the box were two Ork Mega-Gargants, the Orkish answer to Emperor Titans. On top of this, each army received some new toys. The new toys consisted of a raft of new anti-flyer guns, Knights (for the imperials) and company cards that allowed the fielding of Gargant big mobs, Titan detachments, and super heavy war machines. This box was a welcome addition to second edition, providing more troops, options and Tactics as well as a slight rules Tweak that closed a few of the many loop-holes. The box contents were well worth the money spent and contained enough to get started with the Epic gaming system. After launch, many new units were added to the Epic system through White Dwarf, including: Space Marine Razorbacks, the long missing Nurgle and Slaanesh Daemon Engines, Eldar Scout Titans, Imperial Flyers, Chimera variants and the powerful Ordinatus.